Bridgeport, CT – The Housatonic Museum of Art presents Rick Shaefer: Drawing the Line on view in the Burt Chernow Galleries, 900 Lafayette Blvd., Bridgeport, CT, from February 12 through March 27, 2015 with a reception open to the public on February 12 from 5:30-7:00 pm. The Burt Chernow Galleries are free and open seven days a week. Visit the website, www.HousatonicMuseum.org for gallery hours. Drawing is essential to the training of an artist. It is the most direct medium between the artist and his observations, thoughts, feelings and experiences—serving both as a record and as a revealer of truth. Drawing is both a cognitive and manual process that provides the foundation for painting, sculpture and architecture. 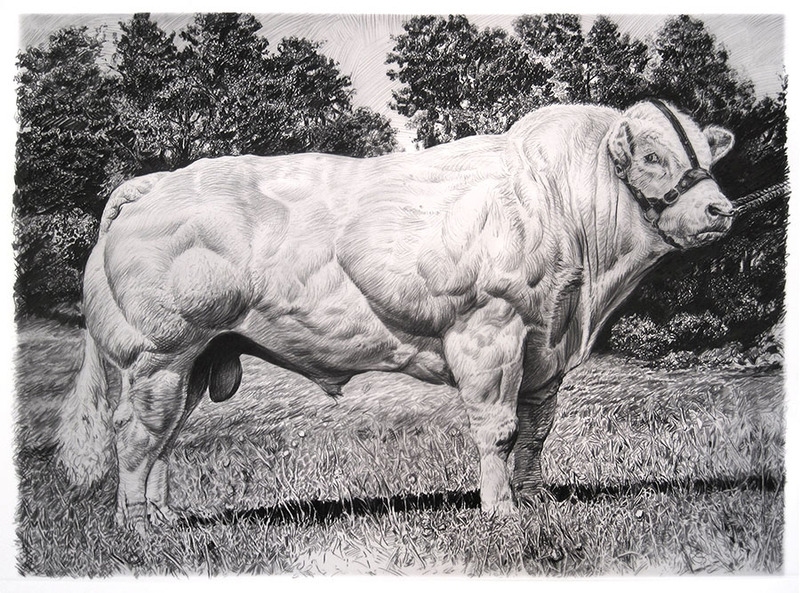 Fairfield artist Rick Shaefer’s monumental, breath-taking drawings offer viewers an adventure in looking with his technically precise and visually poetic drawings of animals and nature. At first glance, it is clear that Shaefer has more than a passing acquaintance with works of art across time. Of all the masters he has studied, it is Albrecht Durer that has influenced him most. In the 16th century, the natural world of animals and plants had become the focus of scientific and cultural interest as explorers returned from far-flung places carrying examples and illustrations of exotic new species. One of Durer’s best known pen drawings, Rhinoceros, 1515, demonstrates the artist’s fascination with recording the curiosities and wonders of the world. Paradoxically, Shaefer’s own African Rhinoceros, beautifully rendered in rich charcoal on vellum, comes full circle by documenting what now may be the waning days of these magnificent beasts. 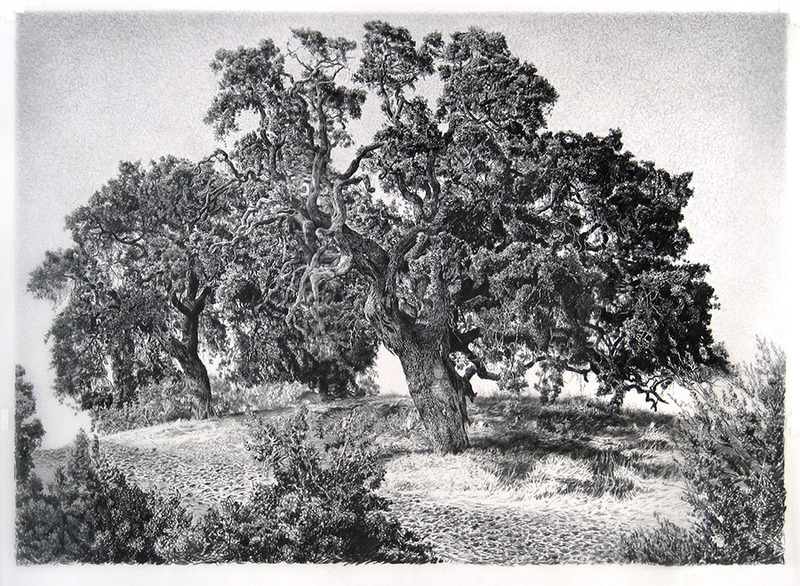 Shaefer’s trees, crowned with leaves or barren and in varying states of decay, are densely detailed and sensitively modeled through the use of tonal gradations. Majestic oaks and tangled vines allow the artist to mine the sculptural properties of a charcoal line, expressing not only what he observes but how he feels. A dramatic narrative unfolds before the eye, compelling the viewer to travel along through the light and into the shadows. And, like the rhinoceros, these powerful and confident drawings circle around a common theme: the effects of human activity on nature. Climate change specifically could lead to the massive destruction of forests as well as the extinction of countless species. Global warming has led to the increase of forest fires as well as a proliferation of pests and diseases. Rick Shaefer: Drawing the Line looks to the rich tradition of drawing in order to explore the critical issues of our time. Rick Shaefer, of Fairfield, Connecticut, maintains a studio at The Nest in Bridgeport, Connecticut. Shaefer studied painting at Duke University and then took up the study of photography at Art Center College in Los Angeles. After art school, he moved to New York City and opened a photography studio specializing in fashion and photo-illustration working primarily for magazines as well as designing book jackets, album covers and movie posters. Since the 1990s, Shaefer has devoted his time exclusively to painting and drawing and he is represented by the Sears Peyton Gallery in NYC.